Our last day in Calistoga started off with an early show. While enjoying a few more minutes of post-dawn slumber, we were awakened by quick bursts of a propane burner. "I know that sound," piped M as she jumped out of bed. "It is balloon!" What a gorgeous way to start a day that wraps up a fun-filled weekend. Bullwinkle and his trusty sidekick Rocky both made the trip to the Napa County Fairgrounds on Friday morning. They're not set up for towing (yet), so P and M caravanned through wine country to the top of the valley to set up camp quickly before taking off in the Jeep for a bicycling and wine event at the nearby Meadowood Resort. 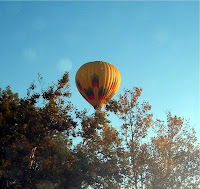 What a treat to have wheels on camping trip, especially in Napa Valley. With the grapes recently harvested, the vineyards are beginning to display their brilliant fall color. The weather was spectacular all weekend. So, we got out and enjoyed it as much as we could. Saturday we explored in and around Calistoga and did a little geocaching, with mixed results. 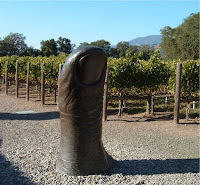 With lots of time for fun and relaxation with Rocky and Bullwinkle, we give Calistoga a big "thumbs up". All four of us are home once again. 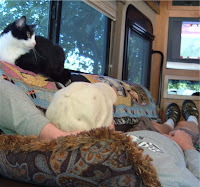 The furry RVing "newbies" have both found sunny spots to take a well-deserved rest after their maiden voyage. We are absolutely delighted with how they fared. Despite the hide-n-seek incident on Friday night, the weekend went very smoothly. By this morning, our feline friends had actually adapted quite nicely. Our girl kitty hopped out of bed this morning and headed straight for her favorite spot...the front window. From there she could keep an eye on everything -- campers, dogs, falling leaves. So much to see. She makes a nice dashboard cat, don't you think? 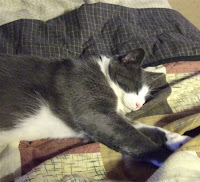 While it took our boy kitty longer to get comfy, he managed to make up for lost time. 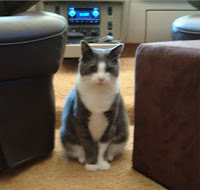 While his sister was peering out the front window this morning, he was the last to get out of bed. Though we needed to get busy getting packed up to go, we had an extra cup of coffee and let him sleep. How could you disturb this? The Stockton Delta KOA delighted us, too. In our search for a "home campground" within an hour or so from our house, we think we've found it. For a quick weekend place to get away for a night or two, this might just be the place. We'll definitely be back. After a too-long camping hiatus, we're out and about for another weekend on the Delta. This time we're checking out the Stockton Delta KOA. It's in between Lodi and Rio Vista on a two lane crummy California highway that - because it's the Delta - is extremely windy. (That's blowing wind, not winding.) P gets big points for maneuvering the moose along the route, which ended with this rather long and narrow bridge across a waterway. 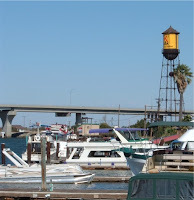 We were really glad to see that red and yellow teepee on the water tower. This stretch of land along the water is called the Tower Park Resort, which features a restaurant, marina, many covered berths containing boats of every size and shape, and of course our KOA. We have a special place in our hearts for KOAs, because we spent our first night ever in an RV under the warm glow of the teepee. And, that's where the RVing bug got us! All KOAs are not created equal, but this one rates right up there. 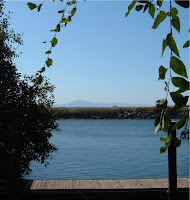 While a scenic shoreline is just steps away, we're actually quite sheltered from the Delta breezes. (We especially appreciate that!) We have outdoor furniture and a chiminea at our site, which is a nice extra. Our pull-through site is well shaded and doesn't block our satellite. Now, that's something special! This weekend the campground is home to the California Bluegrass Association, which is hosting its fall campout. There are pickers and fiddlers warming up around the place. 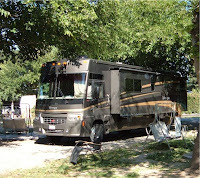 It reminds us of the many trips we used to make to Winfield, KS for the Walnut Valley Bluegrass Festival. We were in a little tent back then. We'll have to take Bullwinkle there sometime! This is a big weekend for our cats, too. We got brave (or crazy) and decided to bring them with us. So far, so good. 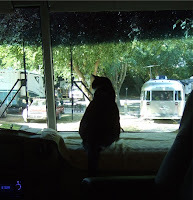 One cat is quite comfortable with her home on wheels. She camped out on the sofa and checked things out while her "daddy" watched KU beat Colorado this morning. Rock chalk! We're looking forward to everyone getting more comfortable as our big plans for tonight are to kick back and relax beside the fire and listen to the sounds of some mighty fine West Coast bluegrass.